17/09/18<br>Could this be the Future of Mobility? Could this be the Future of Mobility? Whilst the exact destination of future automotive design may still be very much up in the air, one trend keeps coming back to the surface: multi-purpose autonomous vehicles. Showing their vision of what we could eventually see on our roads, Mercedes-Benz are the latest to unveil their version of this futuristic genre. They’ve named it the ‘Vision Urbanetic’ and it’s a multi-purpose design that is solely based around an autonomous and fully-electric flatbed base. Like other concepts of this genre, the advantage of Vision Urbanetic is that each base vehicle can be easily adapted for use in very different circumstances. This means that, if the vehicle is needed to transport items, a van body can be easily slid into place on top of the flat base. 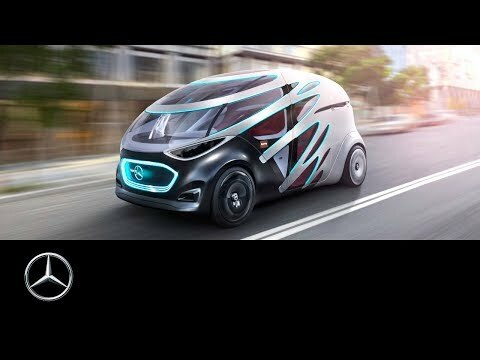 Mercedes-Benz say that the van attachment that they have previewed with the concept can easily carry up to 10 pallets. With many of the world’s cities now saying that they may ban all but electric vehicles on their roads, this design could be perfect to continue large transport runs. Should the Vision Urbanetic not be needed for transport duties, it can easily be fitted with a transport module for people. Once again easily slid into place by a very small team, this passenger body would be capable of comfortably seating 12 people in a cabin that is filled with connected technology. When not in use, the Vision Urbanetic would be able to autonomously head to its next destination (for either of the above duties) or to a central hub where it could recharge its battery until it is once again needed for passenger or commercial transport use. Designed to create a “completely new mobility concept for an on-demand, efficient, comfortable and sustainable mobility”, the Vision Urbanetic helps to combat various issues that have been recently appearing when it comes to air quality, overcrowding and the overall future of our cities. What do you think of Mercedes-Benz’ new concept? We’d like to hear from you on Facebook, Twitter or Linkedin. New AMG GT 4-Door Coupe offers AMG performance and practicality.